Chinless Deluxe Over Head Topper Horror SKELETON SKULL HALF MASK Monster Halloween Party Cosplay Costume Accessory. Frightfully scary design changes your entire appearance without extensive make-up or prosthetics. Great addition to a Grim Reaper or Angel of Death costume. Gothic Witch Grimoire DARK MAGIC SPELL BOOK ANIMATED PROP Horror Halloween Haunted House Decoration - The mystical book of shadows slowly opens with motion and sound, while her spooky Wiccan sorceress voice casts magical incantations. Creepy illuminating lighted page display! 54-inch Gothic-ZOMBIE GHOUL CORPSE-Realistic Dead Body Halloween Prop - 4-feet-6-inches (135cm) Tall Smaller than Adult *Life-Size (*Child-Size) *SHRUNKEN HEAD FESTER GHOUL ZOMBIE CORPSE Gruesome PROP Hanging Halloween Haunt Prop Decoration Detailed Hangman Un-Dead Body. Spooky SKELAMINGO Skeleton Zombie Flamingo Gothic Horror Halloween Prop Decoration. Shock friends with a wicked creepy twist on a classic lawn ornament! Scary sculptured garden statue of a dead skinned bird with detailed skeletal bone structure yard figurine, will turn heads! 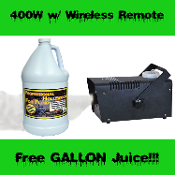 FOG MACHINE 400W w WIRELESS REMOTE-FREE FOG JUICE-Halloween Prop Special Effect - 400 watt down-sized, metal construction, fog machine with wireless remote. New design is much lighter and easier to handle. Activate with included wireless remote from up to 30 feet away! 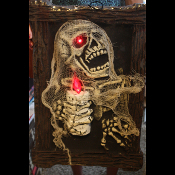 Gothic Light-up Creepy ZOMBIE SKELETON PORTRAIT Walking Dead Decor Halloween Party Prop. 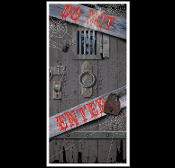 Dimensional Haunted House Picture with Lighted Candle Lamp Realistic Flame Bulb. Eyes Flicker! Horror Movie Night Haunt Wall Hanging Cemetery Graveyard Crypt Décor Prop Building Supplies. LIFE-SIZE 3-Piece BUDGET BUCKY First Quality GLOW-in-the-DARK HUMAN SKELETON SKULL Needs no batteries... Charges in Bright Light! LifeSize Anatomical Articulated Human 3-Part Skull. 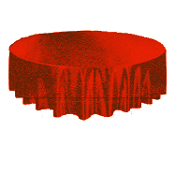 Cheap Halloween Prop Decoration at a great price. Movable jaw, removable calvarium. Life Size Realistic Decapitated Severed Heads WARNING ZOMBIES AHEAD Wall Hanging Sign Plaque Halloween Decoration Horror Prop. Horrific hunter trophy cut off bloody undead display. Mount over window, door, den wall. Gruesome haunt statement. Walking dead party gothic decor! 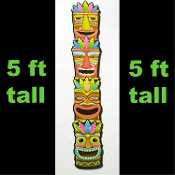 5-Ft Large Jointed Tropical Island TIKI MASK HEAD TOTEM POLE Figure Cut Out Beach Pool Luau Party Voodoo Wall Hanging Door Window Decoration. New 60-inch tall x 9-inch wide Cardboard Paper Bright Multi-Color Hawaiian Tahitian Tiki Bar Decor Cutout. 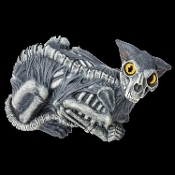 New Life Size SKELETON ZOMBIE CAT-Gothic Halloween Horror Prop Yard Decoration. Detailed skeletal dead skinned, zombiefied cat. Even zombies have pets, and this figure has creepy big yellow eyes. Great for indoor haunted house or outdoor cemetery graveyard garden scene. 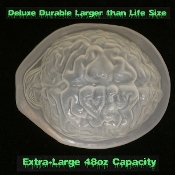 DELUXE Larger than Life Size Human BRAIN GELATIN ICE MOLD Creepy Zombie Food Halloween Party Decoration Durable Jello Dessert Mould DIY Crafts Horror Prop scary Walking Dead Body Part. Freak out friends with a ghoulishly cool spooky appetizer! BRAINS, BRAINS, Must Eat BRAINS! 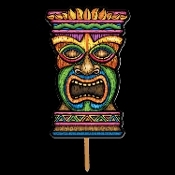 3-D TIKI HEAD MASK DOOR PLAQUE YARD SIGN Wall Hanging Luau Party Decoration- Bright Multi-Color Plastic Art Form. Perfect for tropical Hawaiian island celebration or beach party! Not flat like most other decorations. 18-inch tall x 11-inch wide on 24-inch wood stake. Gothic Black Lace Damask SKULL BATS CURTAIN Lamp Shade Cover Door Topper Valance Window Swag Cosplay SHAWL Costume WRAP. 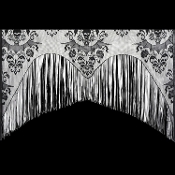 Sheer Steampunk Goth Mantel Border Shroud Table Edge Decor. Haunted House Halloween Party Mansion Castle Dining Room Decorations. Creepy Realistic EYEBALLS EYES - CLEAR with BLUE - Gross 3-Dimensional Doll Halloween Haunted House Horror Prop Building Crafts Supplies. Hannibal,Dexter Serial Killer Costume Accessories. 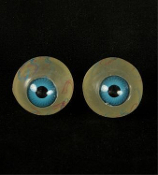 Doctor, Nurse, Medical Optician, Anatomy Body Parts Collectors keep an eye on these! Creepy Realistic EYEBALLS EYES - WHITE with BROWN - Gross 3-Dimensional Doll Halloween Haunted House Horror Prop Building Crafts Supplies. Hannibal,Dexter Serial Killer Costume Accessories. Doctor, Nurse, Medical Optician, Anatomy Body Parts Collectors keep an eye on these! 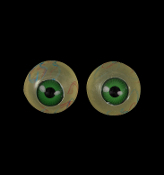 Creepy Realistic EYEBALLS EYES - CLEAR with GREEN - Gross 3-Dimensional Doll Halloween Haunted House Horror Prop Building Crafts Supplies. Hannibal,Dexter Serial Killer Costume Accessories. 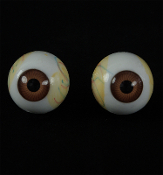 Doctor, Nurse, Medical Optician, Anatomy Body Parts Collectors keep an eye on these! 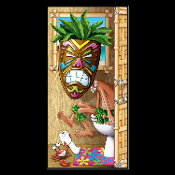 Funny Toilet Loo TIKI HEAD MASK on the POTTY BATHROOM DOOR COVER Shower Mural Restroom Wall Decor Create-a-Scene Setter is the perfect decor for any tropical Hawaiian island Luau celebration or beach party! Whimsical gag gift Voodoo jungle native grimacing on the commode. 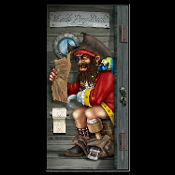 Funny Toilet Loo PIRATE CAPTAIN in YE OLDE POOP DECK BATHROOM DOOR COVER Shower Mural Restroom Wall Decor Create-a-Scene Setter. Perfect for birthday, Luau celebration, beach party or Booty lover! Whimsical gag gift peg-legged Captain grimacing on the potty. Watch the hook! Car Window Mirror Cling Decal Sticker CRAZY BLACK CAT BACKSEAT DRIVER Funny Halloween Decoration Birthday Party Supplies. Who's in your trying to escape your house or backseat? 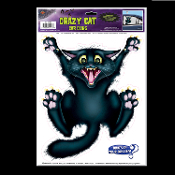 Wildly Crazed Feline Backseat Driver Car or House Static Vinyl Cling. Fun for Halloween or anytime. 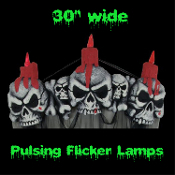 Giant 4x5 SKULL WALL DECORATIONS Halloween Haunted House Scene Setter. Decor for a spooky room display. 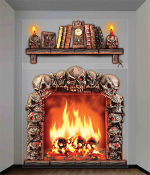 Realistic roaring fireplace with creepy burning skulls in flames, includes bookshelf with skull candle holders, books, spider. Indoor outdoor horror props by Horror-Hall.